This small hamlet grew near a siding on the former narrow gage railway line 20kms west of Merredin and on the eastern side of Lake Baandee. The Hines Hill weighbridge is situated on the southern side of the highway at the site of the original grain bin, when wheat was carted by horse and cart in bags. It was one of the first privately owned weighbridges established in the district. It was installed and ready to use by 1st July 1926. 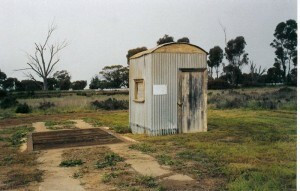 The weighbridge continued in use until the new grain bins (CBH) were built along the railway line for the 1966/7 harvest season. The old have since been demolished but the Hines Hill weighbridge still remains. Hines Hill cemetery is situated off Feineler Road at the bottom of the rock. In spring there is an abundance of wildflowers making this area a tranquil place to remember. The cemetery has graves dating back to 1902. Hines Hill rock is situated off Feineler Road. A short walk through natural bush will bring you to the top where you can view the surrounding area. The rock is home to red kangaroos, echidnas and a variety of birdlife. Accommodation – long or short term airconditioned, clean budget priced accommodation from $60 to $75 plus GST per night. 4 bedroom house, shared bathroom for corporate and contract accommodation.